Paul Weston explores the New Testament writers' view of evangelism. He shows how the early Church possessed an instinctive sharing of the good news because they were people who believed they were firmly within the flow of God's activity in bearing witness to himself. Evangelism was for them and should be for the Church today the natural overflow of an authentic Christian life, discipleship and evangelism being directly connected and evangelism being the natural, organic consequence of discipleship. David Male explores how the local church can embrace this New Testament view. He challenges the church to throw off the misinterpretation of the Great Commission that prevails and realise the main verb of the commission is not to go but the imperative to make disciples. In essence you make disciples as you go, as you live and share your faith. The main goal of ministry therefore is to nurture genuine disciples, teaching people to live the Christian life before talking about it; training people to lead their lives now in the way Jesus would his if he were walking through their town today. If congregations are not helped in this way, the culture around will do the discipling, big brands and prevailing social thought enticing and educating them into their lifestyle. David concludes by posing two questions that all in church need to ponder: first, do you truly believe that the living God is active in his creation? And second, could he possibly use you in that activity? Answers to these questions not only shape an understanding of evangelism but also shape a person's life every day of the week. 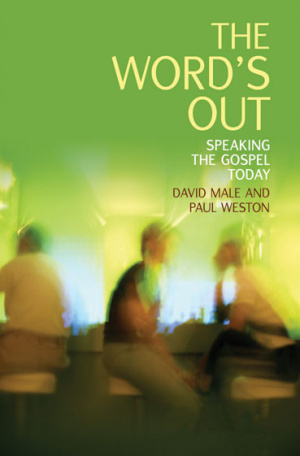 The Word's Out by David Male; Paul Weston was published by Bible Reading Fellowship in March 2013 and is our 10023rd best seller. The ISBN for The Word's Out is 9780857461698. Evangelism is something that most Christians are good at talking about but, when actually confronted with or challenged about doing it, feel apprehensive and anxious. Male and Weston suggest that, at a time when most people do not attend church and have little idea of what the Christian faith is about, evangelism is more important than ever. However, what they propose in their book is that traditional views and methods of evangelism need to be reassessed in the light of what is actually found in the New Testament. Their book sets out to show that evangelism is a team game for the whole church, not just those supposedly "gifted" that way. The authors suggest that evangelism needs to be re-imagined in terms of living the Gospel in everyday life in order to reconnect with those on the church fringe as well as those who are well outside. 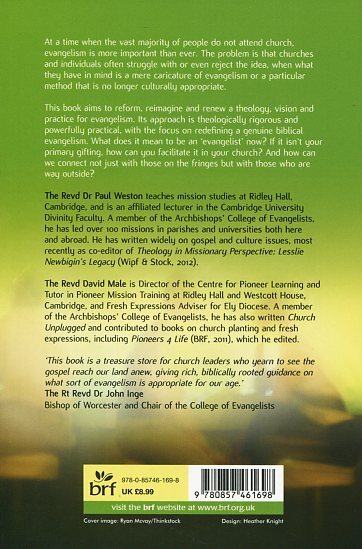 In two main parts the book reflects on some central issues from a biblical and cultural perspective, and then how the principles of biblical evangelism can be earthed in practical ways in the ongoing life of churches and Christian communities. Very readable, this book will set you thinking, whether you are a church leader or someone who sits in the pew. Take a peek at some articles related to The Word's Out. Got a question? No problem! Just click here to ask us about The Word's Out. "This book is a treasure store for church leaders who yearn to see the gospel reach our land anew, giving rich biblically rooted guidance on what sort of evangelism is appropriate for our age." - The Rt Revd Dr John Inge, Bishop of Worcester and Chair of the College of Evangelists. "Evangelism is one of those words that seem to have become one of those embarrassing topics of conversations in recent times. I am delighted that Dave Male and Paul Weston have taken the opportunity to challenge the perceptions about evangelism and to encourage and equip people for the task of being Good News today." - The Revd Dr Joanne Cox, Evangelism in Contemporary Culture Officer, The Methodist Church. "Essential reading for all those who want to see authentic evangelism back at the heart of the church." - Canon Nick Cuthbert, founder Riverside Church, Birmingham. "We need all the help we can get to help ordinary people from all sorts of churches enjoy sharing their faith: bring it on!" - Lucy Moore, Messy Church Team Leader at BRF. "Dave and Paul took a risk writing this. Books that mention the 'E' word simply don't sell as much as those which don't, yet what they have to say is vital for the future of the church, a practical call for all people to engage contextually with the greatest news this world has been graced with. Read it and be inspired." - Revd Chris Duffett, Founder of The Light Project and President of the Baptist Union of Great Britain.